Home > Video Equipment > Questionnaire: Digital or Traditional Video Camera? The advent of digital videography has been of major benefit to filmmakers of every level of expertise, from first-time amateurs to hardened professionals. 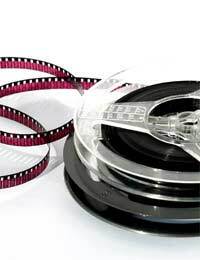 The relative cheapness of digital video cameras, combined with their ease of use and the speed with which footage can be transferred and shared, has meant that amateur film makers have flocked to digital. Traditional, analogue camcorders are now seen by some as something of an anachronism. However, many people still enjoy the process of film making with analogue cameras and film stock. Furthermore, although some blockbusters are now being made with digital stock, Hollywood films are still mainly made with traditional film. It is pertinent to ask why this is. Essentially, although digital sensors are becoming more advanced every day, it is still virtually impossible to get a cost-effective digital camera with as high a resolution as traditional film stock. While most amateur film makers will not need the extraordinarily high resolution offered by film, this is indicative of the fact that analogue vs. digital debate still rages on. This questionnaire should help you identify which medium is best for you. 1. Do you have a computer? 2. Do you intend to edit your footage once you have filmed it? 3. Is it unnecessary for you to have very high resolution footage? Bear in mind that most consumer digital cameras are able to produce footage of at least high enough resolution for display on a large television. 4. Do you wish to share your footage with friends and family after it is shot and, where applicable, edited? 5. Do you wish to place your footage on the internet, for example on sites like YouTube or in order for friends and family to download it? If you have answered ‘yes’ to most of questions 2 to 5, a digital camera is almost certainly the best choice for your purposes. It is important to remember, however, that a digital camera is of very little use unless you also have a computer capable of capturing digital footage. As such, if you answered ‘no’ to question 1, and have no intention of buying a computer, you may be better off with analogue. Further information on the process of digital video capture is available in articles elsewhere on this site. It is also worth remembering that digital has a significant advantage over analogue in terms of longevity. Over time you are likely to notice the degradation of analogue footage, particularly if it is played frequently or the tapes are reused. Digital, on the other hand, can be stored in a lossless format on a computer hard drive and will not degrade over time. This is amongst the primary reasons for transferring video tapes to DVD, for example. Finally, as digital equipment becomes ever more accomplished and ever cheaper, the move away from analogue will continue. As such, if you are looking to make a ‘future-proof’ investment in the field of home video making, you are likely to be better off making the leap into digital as soon as possible.